After the Production Code forced the major studios to shy away from morbidity, violence, and the supernatural, Bela Lugosi (Dracula) found refuge in a place where horror was not only allowed, but enjoying a low-budget renaissance: the independent studios of Poverty Row. 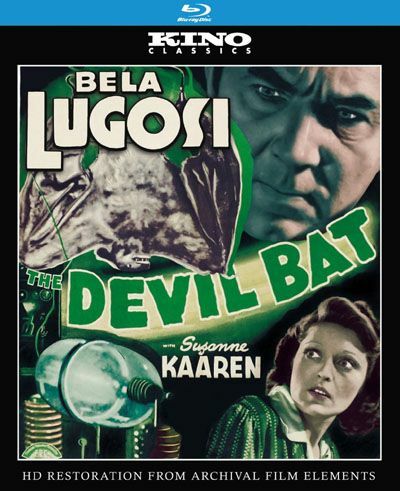 In THE DEVIL BAT, Lugosi stars as a scientist who commands a mutant bat to avenge himself upon his enemies (using a specially formulated after-shave lotion as the targeting device). Even as he takes diabolical pleasure in such a ludicrous premise, Lugosi invests the character with an underlying sense of tragedy, a visionary genius out of step with modern, corporate society. Cast: Bela Lugosi, Suzanne Kaaren, Dave O'Brien, Guy Usher, Yolande Mallott, Donald Kerr, Edmund Mortimer, Gene O'Donnell, Alan Baldwin, John Ellis, Arthur Q. Bryan, Hal Price.